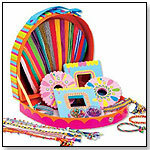 This kit contains materials for making up to 22 friendship bracelets. It includes four looms for two styles and eight patterns, along with 22 colors of floss, beads, a beading needle and a convenient storage case. — As of 05/12/2012 this product has 3.9 out of 5 stars from 54 reviews on Amazon.com. Cons: Instructions are not helpful enough; not enough designs included. — Kim Myers, co-owner of Hobbytown USA in Murfreesboro, Tenn., told TDmonthly in late Spring 2011 that ALEX arts and crafts were best-sellers in their category, especially among older girls. ― As of 9.21.2010, this product had 4 out of 5 stars from 24 reviews on Amazon.com and was No. 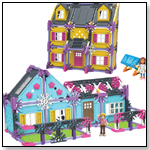 33 on the top 100 best-selling toys and games.